I’m here in Pittsburgh Rosemont United Cemetery at the grave site of Pastor Russell who is the person who started the Jehovah Witnesses and by the looks of this gravestone he’s also a messenger and I want to share his message with you. This is Charles Taze Russell’s great pyramid of Giza tomb site. Charles T Russell believed in pyramidology – he was a stone witness. He got many of his prophecy dates from how many stairs were at the pyramids of Giza, so the Watchtower Bible Society and Tract Society decided to make a pyramid memorial for him. This pyramid has four sides of course. Each side has a cross and crown. The cross and crown is a Masonic emblem and the funny thing is that when I pan over here just a bit, you can see that’s a masonic temple for The Greater Pittsburgh Masonic Center at 3579 Masonic Way, Pittsburgh, PA 15237 United States. There’s some names on here like this one says Chester Russell, but I’m not sure – it’s rubbing away. Now on this side we see the cross and crown and Watchtower Bible Society crossing the society together we got the Holy Bible again and with some names on it and this one is Grace Nandi something. 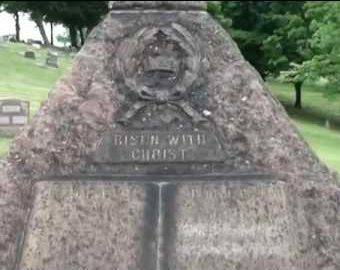 Final side says IBSA which i think is International Bible Students Association and here is the Bible again at Russell’s grave memorial facing the Greater Pittsburgh Masonic Center. I hope my Watchtower friends see this video and recognize that the beginnings of the Watchtower was corrupt it and it still is corrupt. I know a lot of the Jehovah Witnesses don’t know their past and they should. I hope this helps you and God bless.